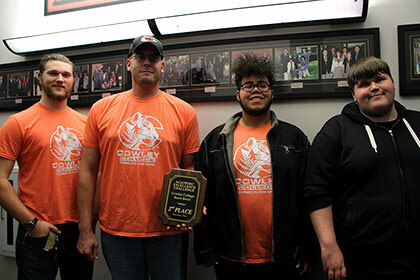 Members of Cowley College's Academic Excellence Challenge (AEC) team competed with a heavy heart while hosting the Snow Bowl competition Saturday at the school’s main campus in Arkansas City. 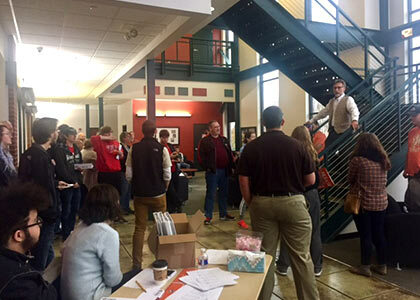 Dr. Harold W. Arnett, Cowley College Vice President of Academic Affairs, welcomed those in attendance and reflected upon the life of AEC team member Garrett Misora, who was tragically killed in a car accident on November 20. Arnett eloquently shared that loss is a part of our lives, and we should deliberately strive to build and maintain relationships. The Cowley A team went on to go 6-2 and place second at the tournament. A team members Daltin Brock and Chase Laporte led the way by finishing 10th and 11th, respectively. Other members of the Cowley A team were, Harvey Baker (13th), and Jesse McCabe (35th). Competing for the Cowley B team, sophomore Chris Simmons’ was Cowley’s top individual finisher as he placed sixth. Other members of the ninth place Cowley B team were, Aimee Schwintz (17th), Dana Risley (34th), Edgar Fuentes (tie for 44th), Ashley Simpson (tie for 44th), and Symantha Shelton (tie for 44th). The Redlands A team went 8-0 to capture the Snow Bowl title, while Johnson County’s Nathan Lucas was the top individual finisher. 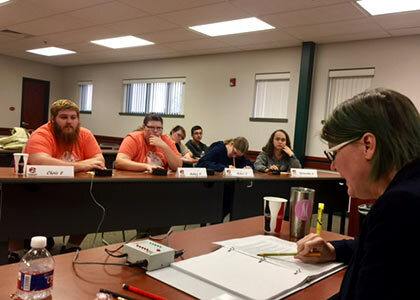 Along with Dr. Arnett, Mark Flickinger, Visual and Performing Arts Chair, Meg Smith, Director of Journalism, and Cowley President Dr. Dennis C. Rittle, joined Cowley AEC alumni Amy Austin, Aniya McGowan, and Mason Warren in moderating and keeping score during the eight rounds of competition. Smith said you could feel Misora’s presence at the competition through the students’ interactions. She appreciated how respectful the students were and was impressed by their ability to answer any type of question. Dianne Flickinger, sponsor of Cowley College AEC teams, praised the work done by custodial supervisor Jack McVey and his crew, as well as Great Western Dining, and members of the Cowley Press. Liz Shepard, Upward Bound Director, also created school logo name tents for each student participant. “This personalization made our guests feel special and welcomed,” Dianne Flickinger said. Team standings: (1) Redlands A; (2) Cowley A; (3) Johnson County A; (4) Allen; (5) Coffeyville; (6) Johnson County B; (7) Redlands B; (8) Garden City; (9) Cowley B; (10) Redlands C; (11) Cloud County A; (12) Cloud County B.